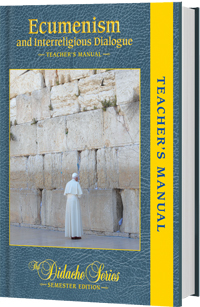 This Teacher's Manual is designed to help the instructor actively engage students in discussions, activities, and reviews that present the teachings of the Catholic Faith on God’s desire to unite all humanity to himself and to each other through his Church. It is a companion to the textbook Ecumenism and Interreligious Dialouge. The textbook, Ecumenism and Interreligious Dialogue, corresponds to Elective E: Ecumenical and Interreligious Issues in the curriculum framework. The textbook (sold separately) is published with ecclesiastical approval from the Archdiocese of Chicago, and it has been submitted for review for conformity with the Catechism of the Catholic Church to the USCCB Subcommittee on the Catechism.